Mille Lacs Wildlife Management Area protects 60.5 square miles of moist hardwood forest and wetlands in east-central Minnesota. 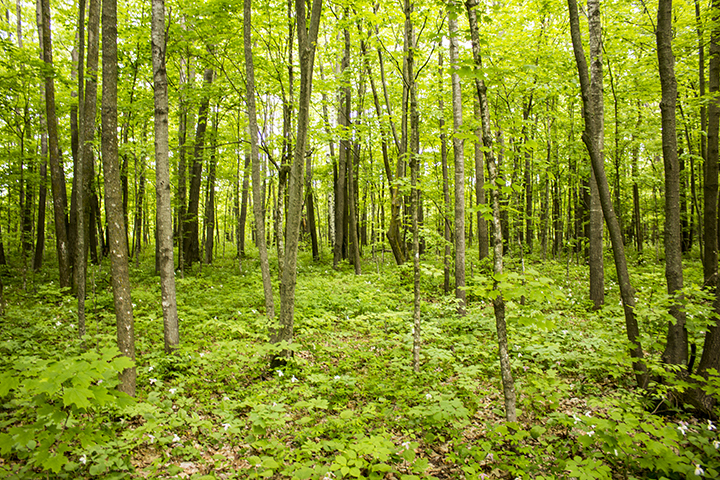 About sixty percent of the WMA is forested, mostly moist red oak – basswood forest. The remainder is wetland, mostly sedge meadow and willow – dogwood shrub swamp. There are 80 parking areas and about 100 miles of forest roads, hiking trails, and hunter walking trails within the WMA. Hunters can stalk deer, bear, small game, forest birds, and waterfowl. Fur-bearer trapping is allowed with a permit. Non-game wildlife found here include red-shouldered hawk and four-toed salamander, both species of special concern in Minnesota. Protected plants found here include bog bluegrass, little goblin moonwort, narrow triangle moonwort, and least moonwort. Visitors to Mille Lacs WMA on Memorial Day weekend will see large-flowered trillium peaking and will attract large numbers of mosquitoes. DEET is highly recommended. This entry was posted in Nature Destinations and tagged Mille Lacs WMA on May 28, 2016 by John Valo. The Laurentian divide is the continental divide separating the area where water flows north to the Hudson Bay or the Arctic Ocean from the area where water flows south to the Atlantic Ocean, Caribbean Sea, or Gulf of Mexico. It stretches from northern Newfoundland south and then west to the Great Divide at Triple Divide Peak in Glacier National Park in Montana. In Minnesota it stretches from the Boundary Waters Canoe Area Wilderness in Cook County to Browns Valley in Traverse County. 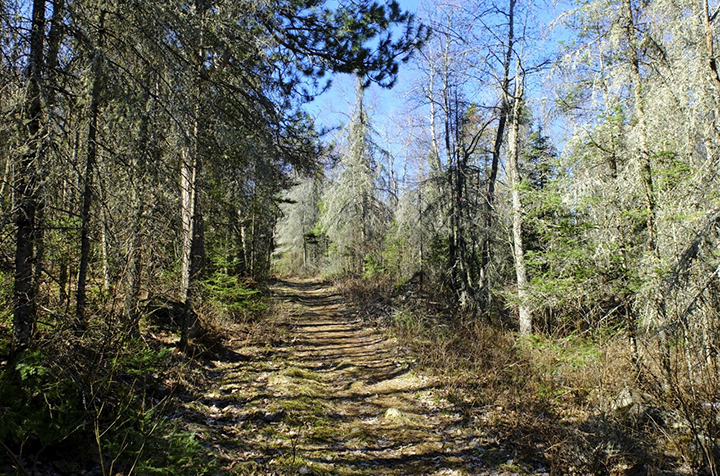 The Laurentian Divide Recreation Area, in the Superior National Forest near Virginia, Minnesota, has 15 miles of hiking and skiing trails and 5 miles of mountain bike trails. This entry was posted in Nature Destinations and tagged Laurentian Divide Recreation Area, Superior National Forest on May 20, 2016 by John Valo. Hen of the Woods (Grifola frondosa) is one of the most easily recognized polypores of eastern North America. The numerous, overlapping, smoky-brown caps are reminiscent of a fluffed-up chicken, giving this mushroom its common name. It is found in deciduous woodlands, especially woodland edges, usually at the base of a dead or dying tree or stump. It appears in summer and fall as a large cluster of rosettes of numerous small, overlapping, fan-shaped caps rising from a single base. Tender young caps are edible after long, slow cooking. Hen of the Woods is distinctive in appearance. A closely related species, Grifola umbellata, is similar in appearance but the caps are larger and lighter in color, and are attached near the center, not at or near the side. It is much less common. 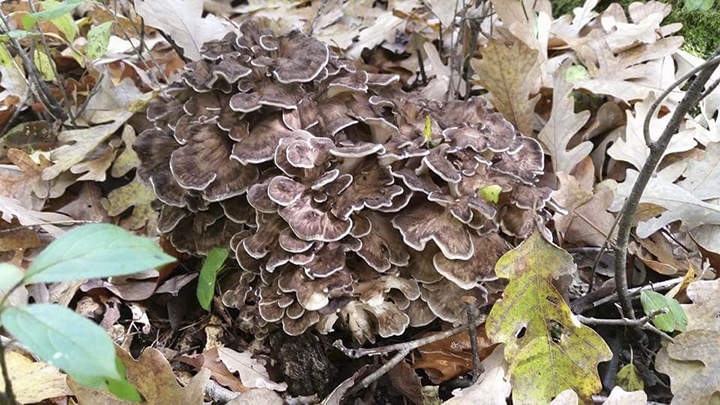 This entry was posted in Fungi and tagged Grifola frondosa, Hen of the Woods on May 15, 2016 by John Valo.